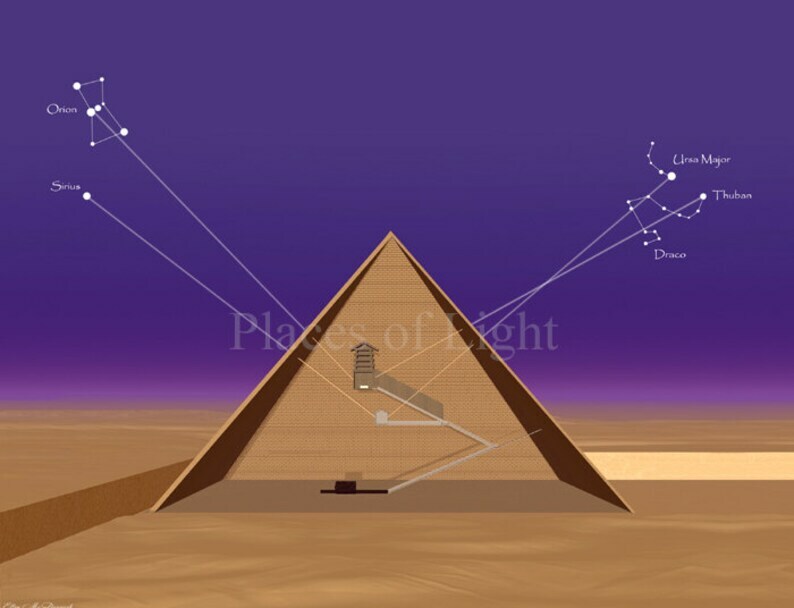 Beautiful art print of "Cosmic Alignment", which shows the mysterious alignments of Egypt's Great Pyramid with Orion, Sirius and Draco. Bestselling item!! Print measures 8x10 and is printed on quality, semi-gloss Archival paper. BESTSELLING IMAGE!! Makes a great gift for the Egypt lover! Within the Great Pyramid, so-called "air shafts" extend outward from both the King and Queen's Chambers. However despite their name, none pierce the outer wall of the pyramid and so were not used for ventilation. Though their true purpose remains a mystery, one peculiarity worth noting is that each exactly points to a major constellation and/or star: Orion, Sirius, Ursa Major, and Draco.